Op vrijdag 16 februari 2018 gaf schrijver, columnist en programmamaker Stephan Sanders op verzoek van de Werkgroep Caraïbische Letteren de vijfde Cola Debrot-lezing in het OBA-Theater aan het Amsterdamse Oosterdok. Het was een zeer persoonlijk verhaal kleur en er wel of niet bijhoren, over etniciteit en drie werelddelen, èn over het Caraïbische gebied waar het gemengde, de creoliteit de essentie van de samenleving uitmaakt, maar waar van de andere kant ook een heel fijnzinnig racisme voortwoekert, voor elk kleurtype wel één, waardoor het sprookje van het probleemloze multiculturele voorbeeld ook hevig wordt verstoord. Na zijn lezing (tekst volgt spoedig) werd Sanders geïnterviewd door Michiel van Kempen; daarna kreeg het publiek gelegenheid tot vragen stellen. Een fotoreportage. Klik hier voor de tekst van de lezing. Nu aanmelden! * Nu aanmelden! * Nu aanmelden! Does’ motto is a beautiful line by Leo Lionni: “From time to time, from the endless flow of our mental imagery, there emerges unexpectedly something that, vague though it may be, seems to carry the promise of a form, a meaning, and, more important, an irresistible poetic charge.” Here we ask her a few questions about her work, her sources of inspiration, and the poetic language of her films. Repeating Islands (RI/IR): I love Leo Lionni’s thoughts on inspiration and creativity, which you have chosen as a motto; based on what he calls that “unexpectedly something,” What inspired you to create films on Trefossa, Anton de Kom, and Derek Walcott? Would you say that there is a quality that the three men shared that led you to this work? Ida Does (ID): Yes, isn’t it just a wonderful motto? I’m a big fan of Lionni and his children’s book about Frederick, the mouse. I have read it to my children, and now read it to my grandchildren. As a matter of fact, I recently gave this book to Derek Walcott for his 84thBirthday. The way that Lionni describes what it means to be a poet, and the value it holds for the community is as simple as it is true. I love that simple, seemingly effortless way of telling stories. I very much relate to that approach in my own work. If you ask me about my main films and the people they portray, one can only see the similarities afterwards; I didn’t plan it, it just happened that way. Looking back there definitely is a quality which these men share: They are all Caribbean pioneers! Trefossa was the first poet to publish a book in the lingua franca of my birth country Suriname, in 1957. His poetry is extraordinary and meaningful, not only for the poetry itself, but also for the emancipation of our language and our collective self-esteem. Anton de Kom was the first black writer of Suriname who studied our colonial history and published a book We slaves of Suriname in 1934. His life was tragic, being banned from Suriname for his progressive views, then arrested by Nazis in the Netherlands, to later die in a Nazi concentration camp in Germany. 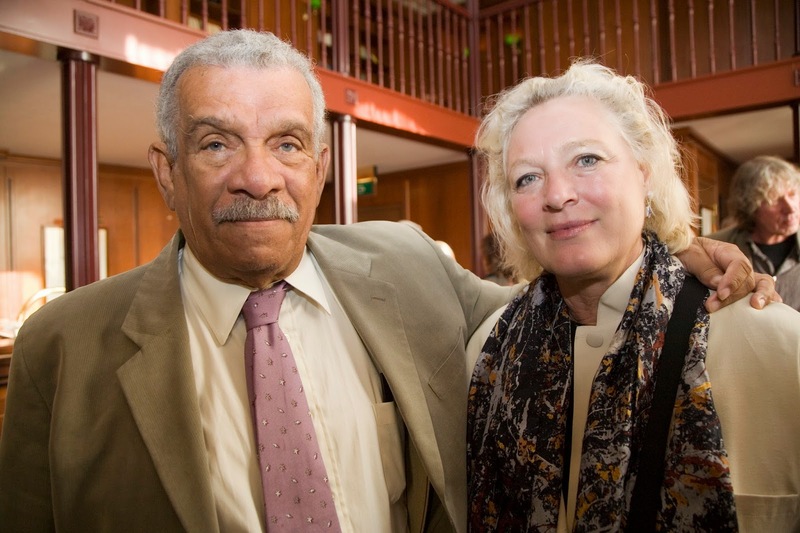 And then of course Derek Walcott, the first colored Caribbean writer to win the Nobel Prize for Literature. My inspiration to make films about these men might be explained by my fascination with history. I have a special relationship with the past, I want to touch it remember it, while I still can. I am always mindful of the passing nature of things, and I have a strong commitment to hold on to these people’s legacy, to tell the story of the contribution they made to our continuity as a group. They helped to define us, younger generations growing up in colonial en post colonial times. It fascinates me how some people find ways to rise above everything with their work and lives, and make such a difference in many people’s lives. People who possess this elusive blend of passion, character, talent, and courage. By making these films I hope to preserve these individuals’ historical impact for other generations. Especially in the Caribbean context, where a lot of stories are still untold, unknown, hidden. RI/IR: How does your background and lived experience shine through in your subject choices and your films as finished product? ID: Being a child of the Caribbean myself, I am naturally attracted to stories from the region that feels most like home. My personal story is one of separation. I left my birth country when I was a young girl, and years later I had to leave it again as a young teacher and mother, after the brutal murders by the military regime in 1982. Since then, I have never returned to Suriname, and had to find a way to deal with that sense of separation and homesickness. I found this when I moved to Aruba. This is my country of (re)birth, a place that has stolen my heart, and that of my family. So, your question is not easy to answer. I suppose you could say that I am deeply in love with the Caribbean, its history, its diverse people, its languages, the diaspora, the longing, and the complexity of our identities. I feel ‘in body’ when I connect to artists and storytellers, scientists, who are, like me, looking for ways to discover our own narrative. RI/IR: I was struck by the photo of Walcott on the first page of site for Poetry is an Island: Derek Walcott and the statement that explains that the documentary presents “an intimate portrait of the St Lucian Nobel laureate for literature set in his beloved native island.” How does a sense of “place” play a role in this documentary (and, perhaps, others you have directed)? 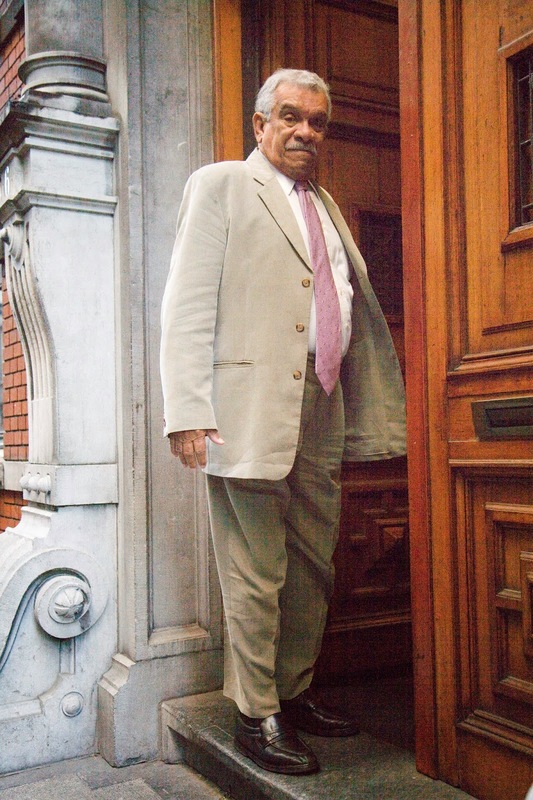 ID: Derek Walcott’s life is long and rich. This ‘fortunate traveler’ has indeed traveled the world and led an international life. The fact that he always remained closely connected with St. Lucia, the island he was born, intrigued me. From the very start I knew that I wanted to film Derek there… in St. Lucia, because I expected (and hoped) to meet him ‘at ease’ in the place that he loved so much. I was curious to film the St. Lucian landscape and to visit the villages that I had read about in Derek Walcott’s work. I wanted to feel and smell St. Lucia in the same palpable way that I experience Walcott’s poetry. Coming closer to Derek Walcott—to me—was to discover St. Lucia and the interaction between the man and the island. And then…meeting with the people that he writes about, the places he describes, the valleys that he portrays; it was so much more than a geographical discovery. When I was there, it felt like I could literally touch Derek’s work, the heart of it. Which is what the film is all about. So, yes, the sense of ‘place’ is key in this film. I could have chosen to follow Derek on his journeys, or interview people around the globe about him and his work, but instead, I tried to zoom in and capture what I felt intuitively was the very essence of Derek Walcott. To me… that is. RI/IR: How was the reception/reaction of the general public and Walcott himself to Poetry is an Island? ID: It was so wonderful. 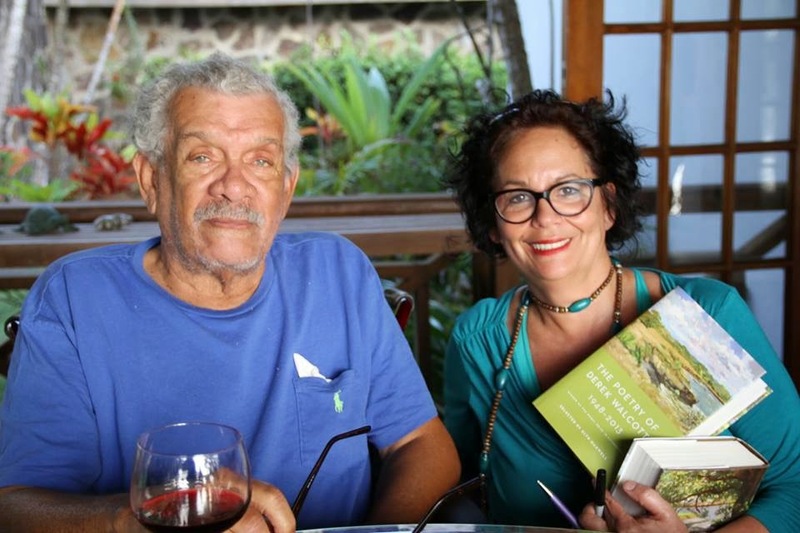 We have had several screenings and Derek Walcott was present at the World Premiere in Port of Spain (at the Trinidad &Tobago Film Festival) and at the Gala Event in St. Lucia during this year’s Nobel Laureate Week. He commented in public in Port of Spain (https://vimeo.com/75951373 ) and after the screening in St. Lucia he told me that he enjoyed it even more, watching it for the second time. Of course that is tremendously rewarding and I appreciated that he had never ever made demands to see the film before it was finished. Based on the responses after the screenings, the emails that I received from people and all the comments and sweet hugs afterwards, I think people like the film. I look forward to more reviews coming out this year, I’d be curious to see how critics receive the film. On our Facebook page and via our website we receive requests to come to all kind of places around the world, so it’s still very exciting. Documentary Channel from Dutch television is enthusiastic about it, and they will screen it on national Dutch television. So yes, there is more to come, for sure. 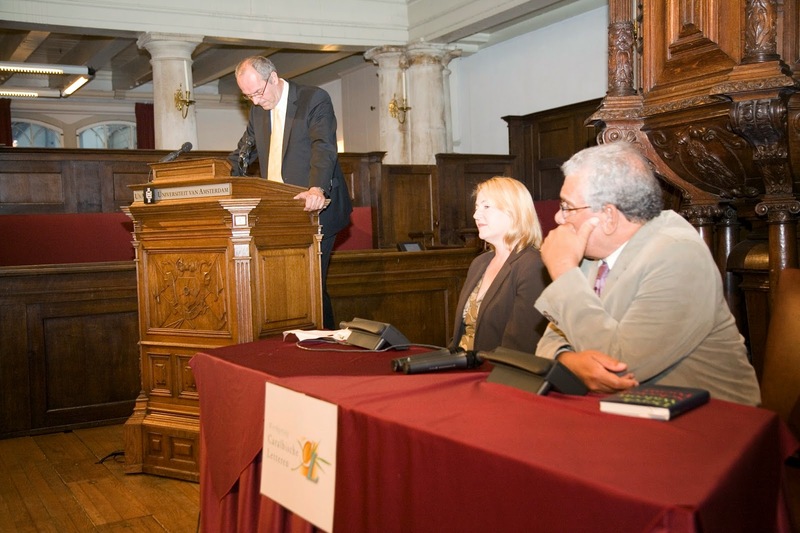 Prof. Michiel van Kempen introducing Derek Walcott, lecturing in Amsterdam in 2008. RI/IR: As an artist, how do you express your own personal “poetic language” through the process of filmmaking? Is this revealed in your selection of visual imagery and setting, dialogue, the type of research, or other choices you make as a director? ID: This is an ongoing process. When we are filming on set, I am like a sponge… my senses are wide open to everything that is happening around me. I am fully present in the moment, fully focused on the energy that’s in the space and the details that are metaphors’ or could become metaphors at some point. By the time we turn on the camera and start the actual filming, I will have read and researched a lot. Often, I have to actively force myself to stop reading and researching, because I need to go into another mindset, when filming. I have to let things emerge…I place my faith in the moment and in reality. I love the phrase ‘romance of discovery’, that’s how I feel when filming. I only feel that I succeed as a filmmaker when my work touches people, on an emotional level, by what happens, emerges, arises. Most of the time it’s not explicit, and that means that I always look for a pace and small things of daily life that we all can relate to. In my choices of imagery, I have to trust my sense of being open to the unexpected and, here’s Lionni again, I just learn to follow ‘the promise of a form, a meaning and the irresistible poetic charge’. It is my goal to tell an honest and authentic story. Always. In doing that, I don’t try to ‘control’ the story, but I train myself to keep the eye of the poet. 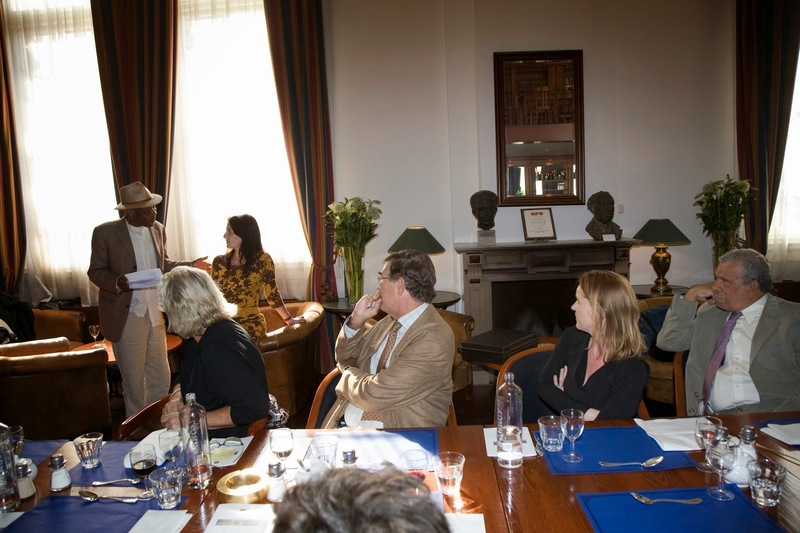 from left Sigrid Nama, Carel de Haseth, Els van der Plas and Derek Walcott.